Linfield will hope to reverse the poor Premiership form against Glenavon which proved costly to their league title bid last season when the sides meet at Windsor Park on Saturday. The Lurgan Blues came out on top in three of the four meetings between the sides in the last campaign. Crusaders, who lie four points behind leaders Linfield, report a clean bill of health, except for Chris Morrow. 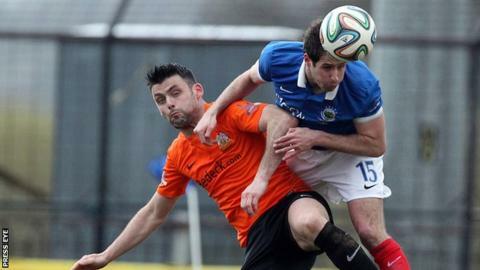 Stephen Baxter's side entertain seventh placed Carrick Rangers at Seaview. Carrick manager Gary Haveron has defender Andrew Doyle back from suspension. Cliftonville are inviting applications for the post of first team manager, but caretaker boss Gerard Lyttle, who has expressed interest in the job, takes charge again for the trip to Ballinamallard. The Mallards have midfielders James McKenna and Shane McCabe suspended as they seek to improve on a record of one win and two draws from their first eight matches. Glentoran welcome back Marcus Kane for their game against Dungannon Swifts, but Jay Magee, Ciaran Caldwell, Jim O'Hanlon, Willie Garrett and David Howland are expected to be missing again. Portadown are without Sean Mackle for the visit of Coleraine to Shamrock Park as he serves an automatic one-game ban following his sending-off against Glenavon on Tuesday night. Bottom club Warrenpoint Town host Ballymena United, who bring Matthew Shevlin and Scottish-based duo Gareth Rodger and Allan Jenkins back into their squad after the trio missed the midweek County Antrim Shield victory over Glebe Rangers. You can follow all the day's football action on Sportsound from 14:00 BST on BBC Radio Ulster and the BBC Sport website.